After the attacks of 2015 Tunisia is back in business — but forsake the beach for its heritage, says Nick Redmayne. “Carthago delenda est” — or “Carthage must be destroyed” — was a favourite phrase of Roman orator Cato the Elder. It took until 146BC and an emphatic victory in the Third Punic War for his punchline to be delivered. Rome’s vengeful legions levelled the city and sold its population into slavery. Today, Tunisia is again reeling in the wake of violence, namely 2015’s two terrorist outrages, at the Bardo National Museum in Tunis and on the beach at Sousse. In a country where tourism was focused almost exclusively in coastal resorts, the attack was well targeted and has decimated the tourist industry. Cheap, all-inclusive beach holidays aren’t a unique selling point; holidaymakers have fled elsewhere. Recent revisions in Foreign Office advice have changed things. Tui has, this month, put Tunisia back on its books for 2018, but whether sun-and-sand tourists will return in their former numbers remains to be seen. We’re in Carthage, Tunisia’s best- known and most-visited Roman site. Perched on the Mediterranean coastline, it is worth visiting for the spellbinding views alone, but in truth, the development of the modern city, combined with centuries of neglect, hasn’t left Dido’s ancient citadel in the best possible state. 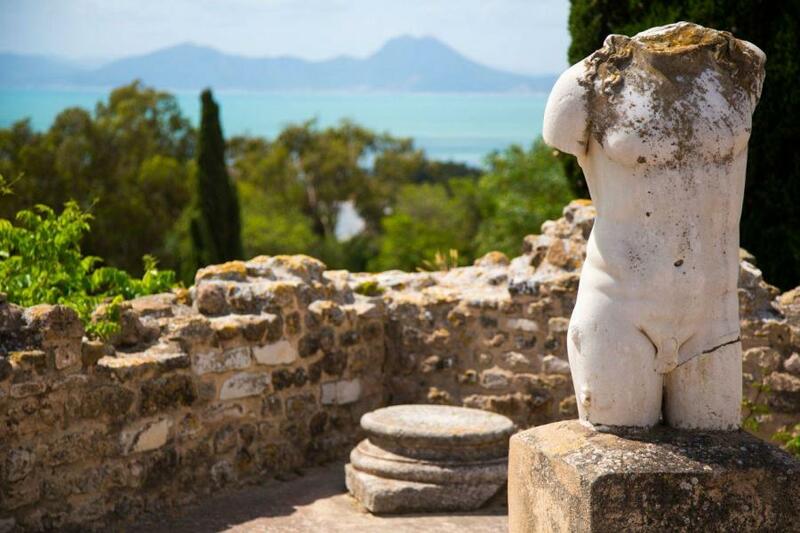 Instead, Chaouki wants to show me some of the country’s lesser-known ruins, all within a couple of hours of Tunis, meaning you can comfortably manage them in day trips from the capital. 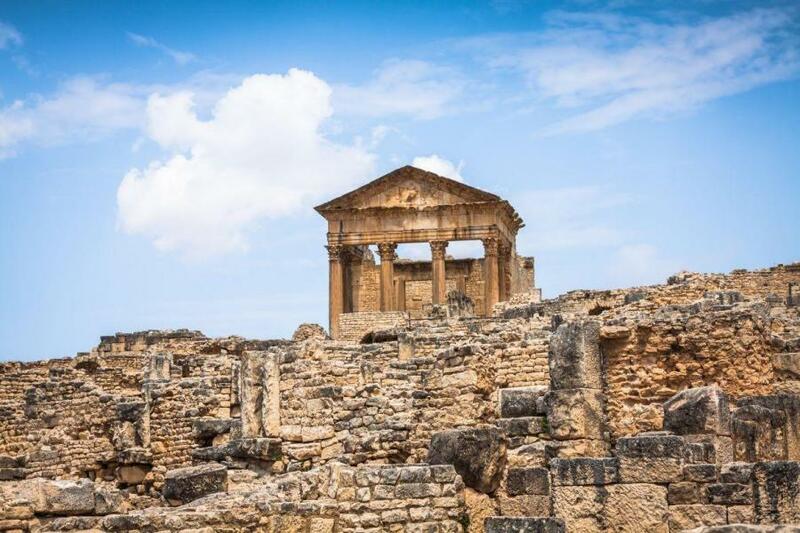 We start with Dougga, a Unesco-designated site, in the north-west of the country, and find we have the place almost to ourselves. Chaouki reckons it’s seven years since he last brought a British tourist here. “Dougga is an atypical Romanised town,” says Chaouki. “There’s no grid pattern. They built on a hilltop and had to work with the land.” Climbing through thistles and scrub, past a couple of dogs, we reach a lookout point — and my jaw drops. Below us is a Tunisian Pompeii: full streets, ruined houses, still-standing temples. Unesco calls Dougga “the best preserved Roman small town in North Africa”. Chaouki eagerly points out characteristic “opus africanum” methods of construction and translates Latin text carved on tumbled tribute stones. We scurry over hypocausts (underfloor heating) and into tepidaria (warm rooms in Roman baths). Walking towards the dominating structure of the town’s capitol — complete with gracious colonnaded portico — I stand on a pavement which, 2,000 years ago, had the directions of prevailing winds carved into it. The same breezes still blow today. The following day we’re on the road again, to Bulla Regia, a Roman site 160km west of Tunis, near the Algerian border. This site lies just outside the “green” zone designated by the Foreign and Commonwealth Office, but is just in the orange, or “avoid all but essential travel” area. To me it felt no different from the other, “safe to travel” parts of Tunisia. But bear in mind that travel insurance is not valid if you stray into the orange zone. We arrive at a café, an interpretative display and even a gift shop. But they’re all closed. Again, we have the site to ourselves: a grid of streets with opulent villas, temples, baths, an amphitheatre and even a brothel still intact. Nearby we spy a group of archaeologists — Tunisian students and UK postgrads. Co-director of the project, Corisande Fenwick from the University of Manchester, is overseeing the painstaking excavation of a human skeleton. This is, she says, a major discovery: a church and a cemetery with hundreds of graves dating from the 4th to the 7th century. 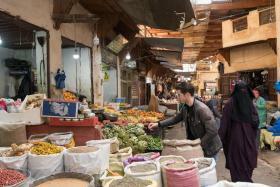 “It shows that Christianity existed after the Arab conquest,” she says. She lets us wander around the site, dodging taped-off areas. We are, perhaps, the first visitors in 1,400 years. Back in Tunis, we make for the Bardo museum and the world’s largest display of Roman mosaics. Security is tight and Chaouki isn’t his usual ebullient self. We walk past breathtaking mosaics — complex works of epic proportions, each seeming to outdo the last. The only known depiction of Virgil, showing him at work writing The Aeneid, sits not far from a portrait of Ulysses. “I was here,” says Chaouki, and it takes me a while to grasp what he’s saying. He was here during the attack on March 18, 2015, when three militants stormed the building and killed 22 people. Here in the museum he tells me about hearing the initial shots, his disbelief. He remembers opening a fire exit to lead tourists to safety. “I remember a lot of steps between life and death,” he says. And then he adds: “This is the first time I visit after that day. Before, I had no reason to come back, and no wish to. But now I am glad to be here.” It may be some time before Tunisian beaches throng with tourists once again, but in the meantime, its Roman heritage is begging for a long overdue fresh look.